Glioblastoma (grade IV astrocytoma) is an aggressive primary brain tumor that is extremely difficult to treat. 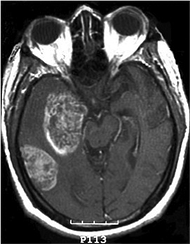 Glioblastoma (GBM), classified as a grade IV (WHO) astrocytoma represents 50-60% of adult primary CNS tumors and differs from anaplastic astrocytoma (grade III) due to the presence of necrotic tissue and hyperplastic blood vessels. Glioblastoma grows rapidly and is the most invasive type of glioma, the malignant cells commonly spreading to nearby brain tissue, making complete surgical resection difficult. 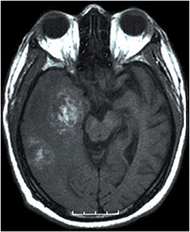 Tumors most commonly occur in the cerebral hemispheres of the brain. Tumors typically contain more than one cell type, a characteristic that makes glioblastomas very difficult to treat. GBM exhibits aggressive spatial and molecular heterogeneity with multiple gene amplification signaling pathways. 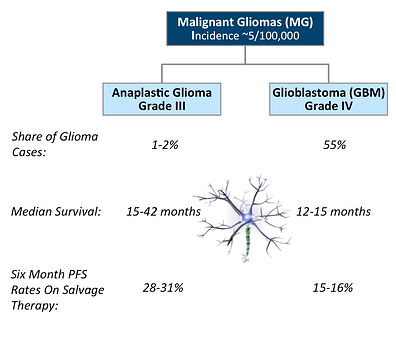 Glioblastomas are highly resistant to common DNA-modifying agents, especially in GBM with unmethylated MGMT promoter (55%); about 45% have methylated MGMT promoter, which responds to Temodar®. There is an unmet medical need for treatment, as the current prognosis for these patients is that only 8.7% survive for two years. The therapeutic window for patients with recurrence is narrow. 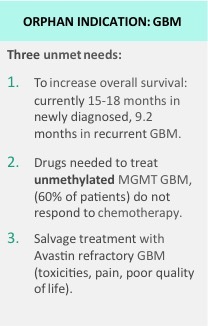 The treatment options for recurrent GBM are Avastin® and off-label use of several chemotherapeutic agents (lomustine). However, Avastin® does not improve Overall Survival and has serious side effects. Sources: American Brain Tumor Association. Available at: www.abta.org. 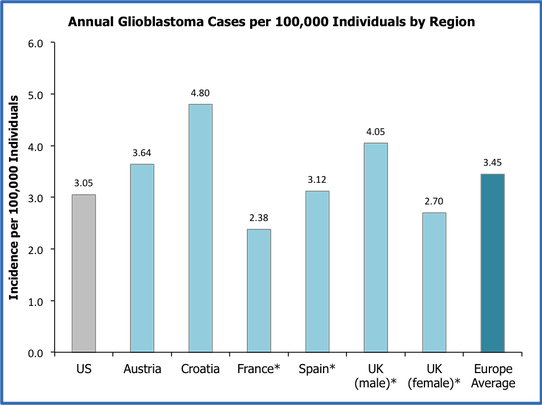 The average incidence of glioblastoma in Europe is similar to the US at approximately 3.5 cases per 100,000 individuals. Annually, approximately 23,000 adults in the US are diagnosed with primary malignant tumors of the brain and spinal cord. Sources: Brain and Other Nervous System Tumors. National Cancer Institute SEER Database. Available at: www.seer.cancer.gov. 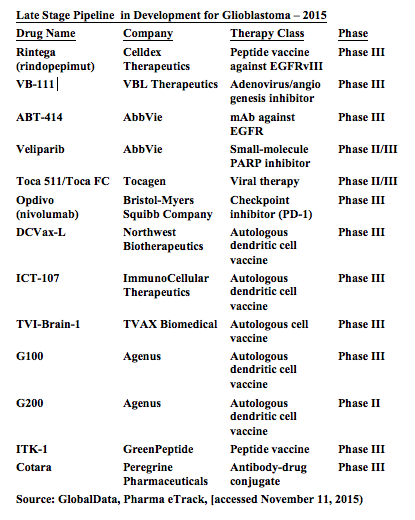 Due in part to a number of failed trials, there are few promising products in late-stage development for glioblastoma. Key unmet needs in the treatment of gliomas include extending overall survival and addressing Avastin (bevacizumab) refractory patients.